The Kenton County Public Library has several branches, all of which are located in Kentucky. The Covington branch of the Kenton County Public Library is the one that holds genealogy classes. They are offering a variety of genealogy and family history classes in February of 2017. Some of the classes offered by the Kenton County Public Library are held at the Covington location. Others are held in that location but are also streamed live on Periscope (at periscope.tv/kentonlibrary). Learn about the many online resources for searching newspapers. The same class will also be held on February 3, 2017. 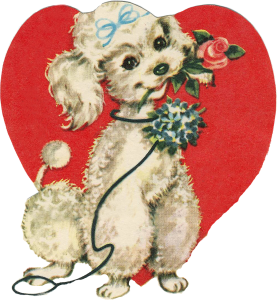 Love the traditional valentines of the past? Watch a live broadcast to learn to DIY your own! View this class online via Periscope. Join them for a live-streaming broadcast to learn about the Mary E. Smith Cemetery and the records available through KCPL’s GeKNY database. View this class online via Periscope. Join them live on Periscope as they visit memorable locations that were impacted by the worst flood in Northern Kentucky history. Just getting started on a family history project or looking for help with a genealogy “brick wall”? Call the Local History & Genealogy Department to reserve a one-hour session to discuss resources and search strategies. This class will also be offered on February 25, 2017. Learn about the many online resources for researching African-American history. This class will also be held on February 15, 2017. From coroner reports to children’s’ home records, the Library regularly adds thousands of full-text entries to their GeKNY database. Find out what these collections are and what will be coming soon. Registration required. Learn about this compelling story from Northern Kentucky’s history. “Why can’t I find my grandmother’s marriage record in Kenton County? Explain it like I’m 5!” An easy-to-understand explanation of how to find marriage records across Northern Kentucky. View this class live on Periscope. Join the Library’s History Department to learn about the many online military history publications available for searching and what they can tell us about our ancestors. This month’s is a “What I’ve Learned” session. Bring your latest genealogy success stories, webs sites you’ve discovered, or any other resources you want to share. Refreshments will be served.